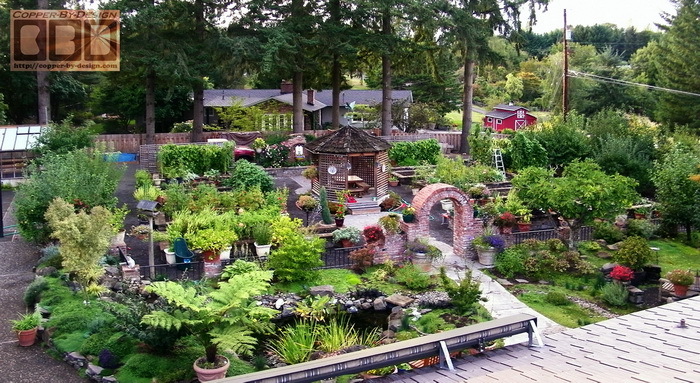 I had taken this photo of their beautiful garden area back when I bid the chimney caps. 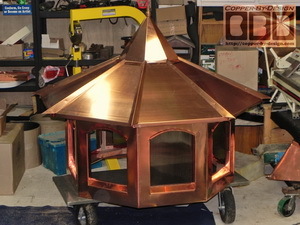 I suggested they would do well to have me make them a small copper roof cap for their gazebo to hold their weathervane. 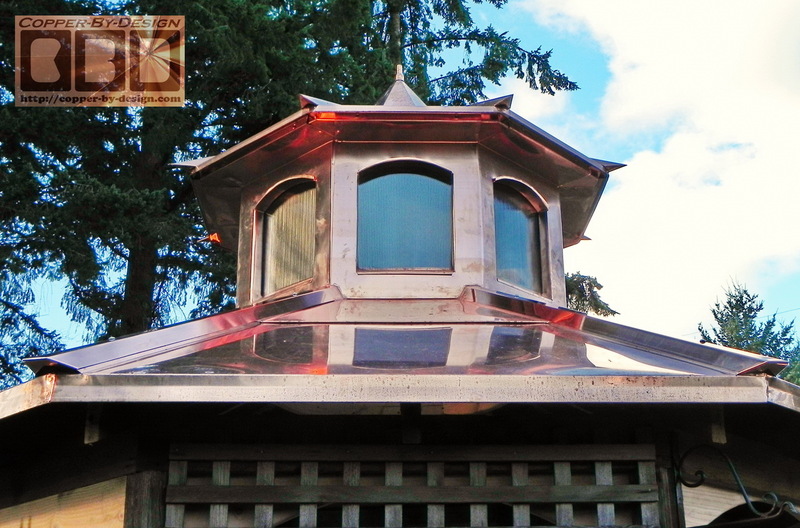 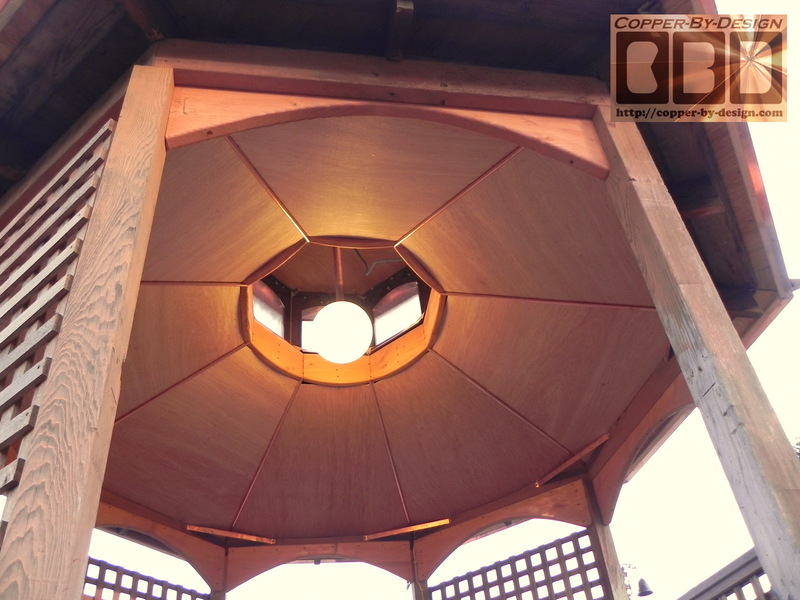 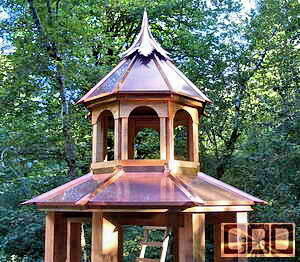 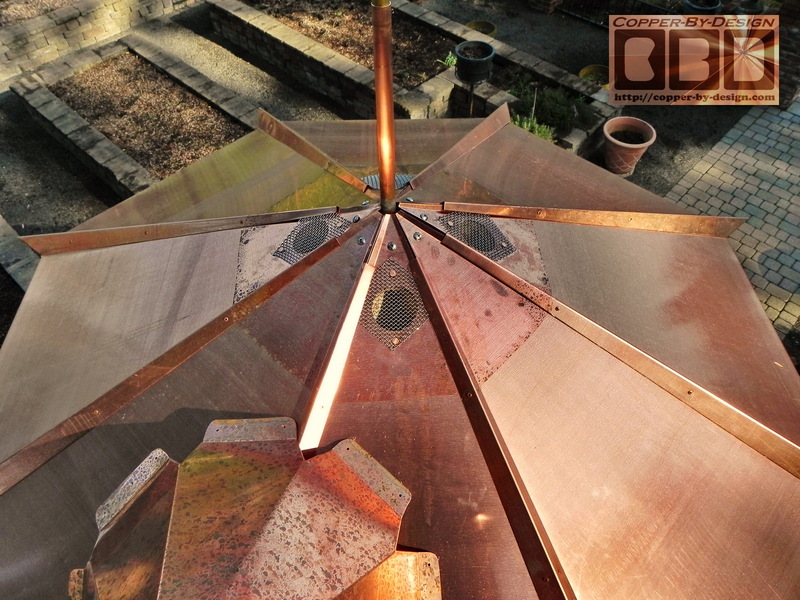 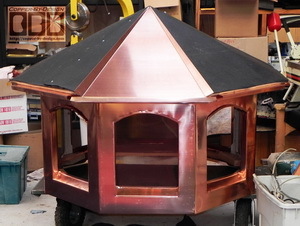 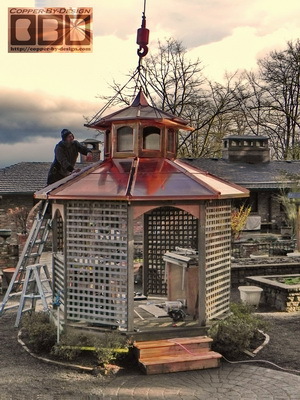 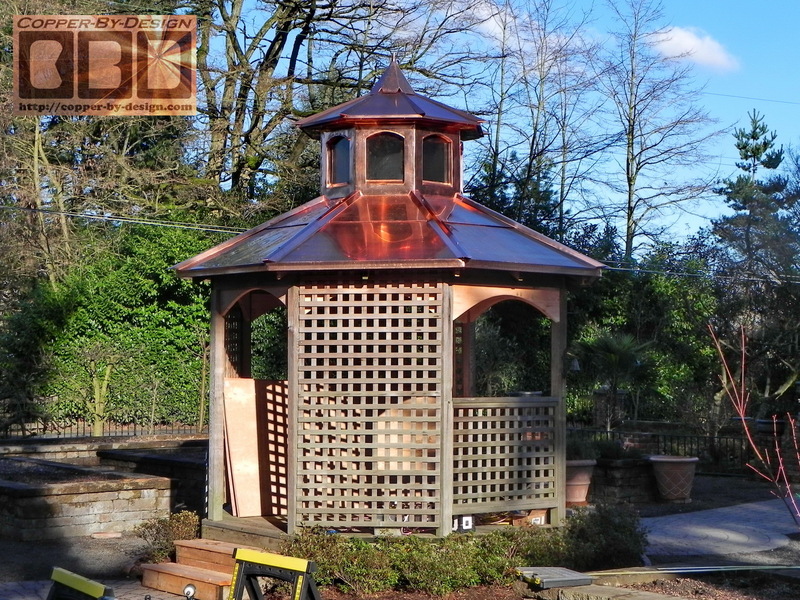 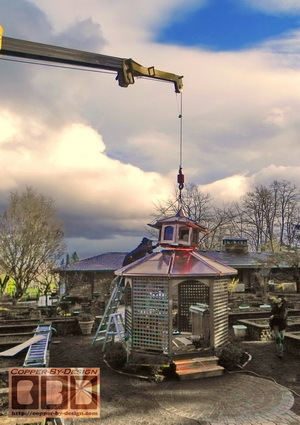 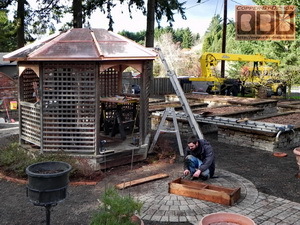 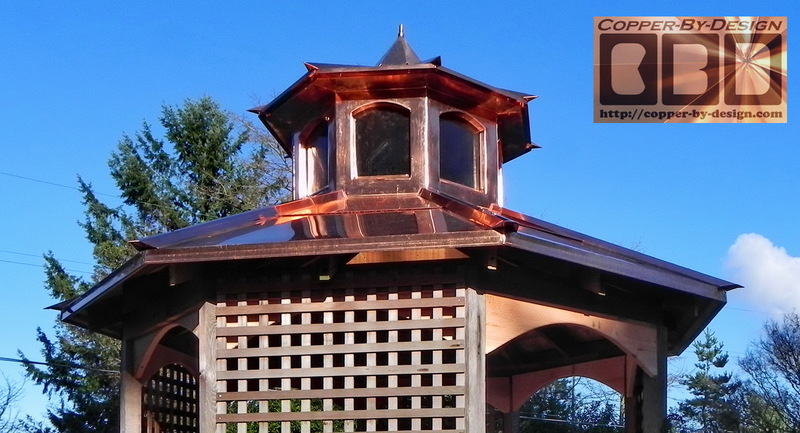 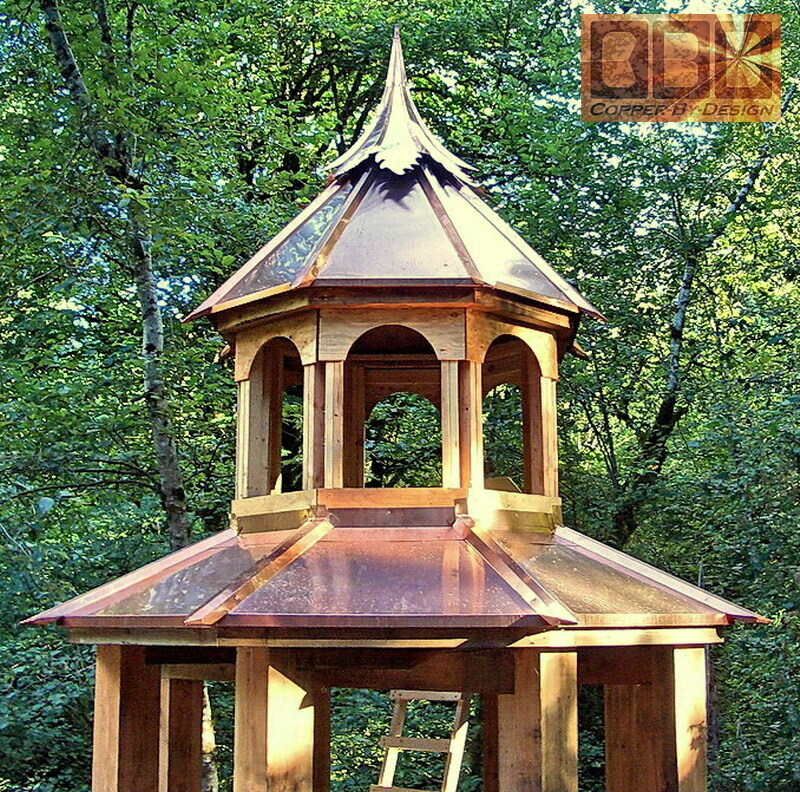 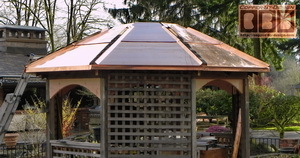 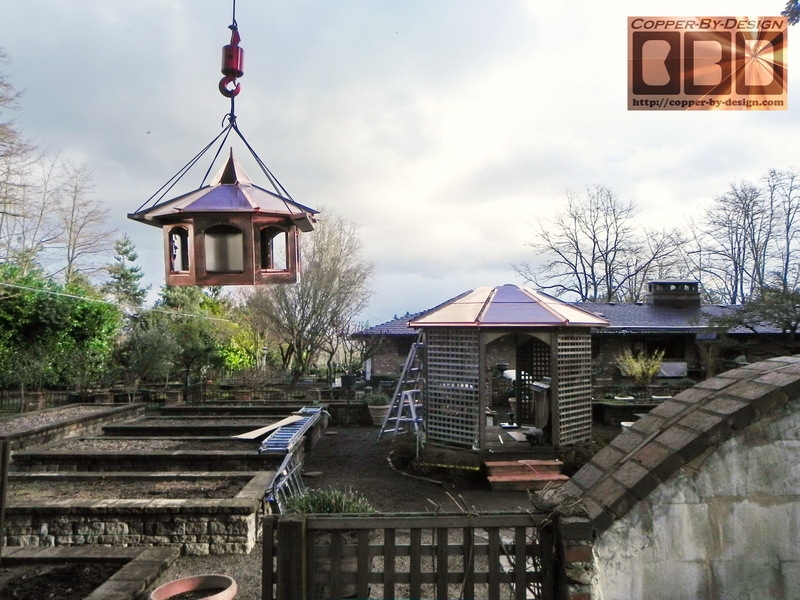 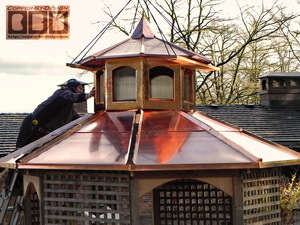 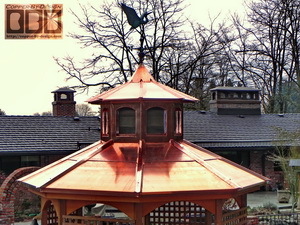 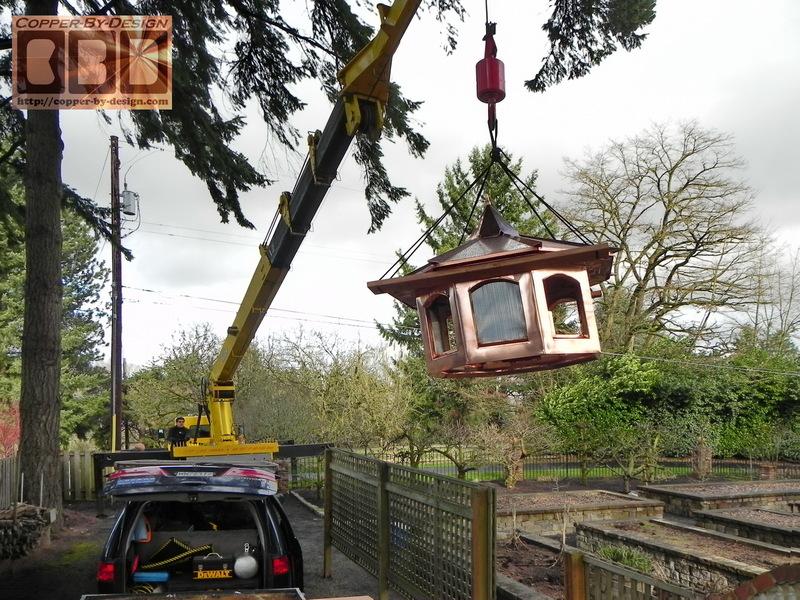 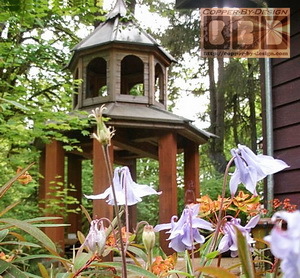 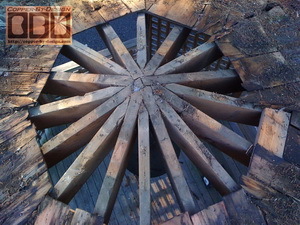 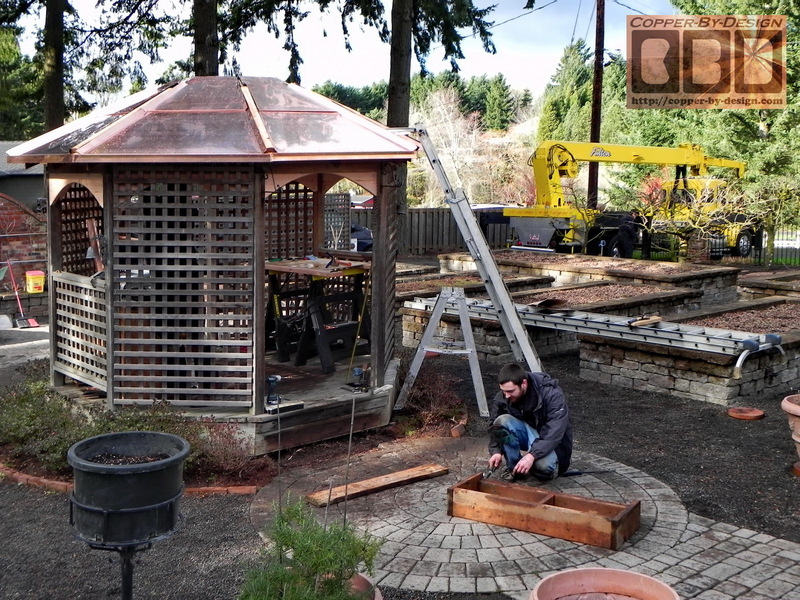 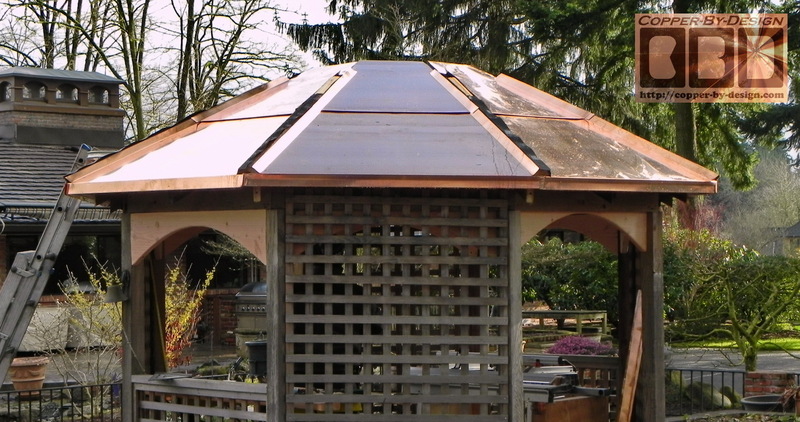 I was surprised to hear a year later they wanted the whole gazebo covered with copper and make them a cupola as well. 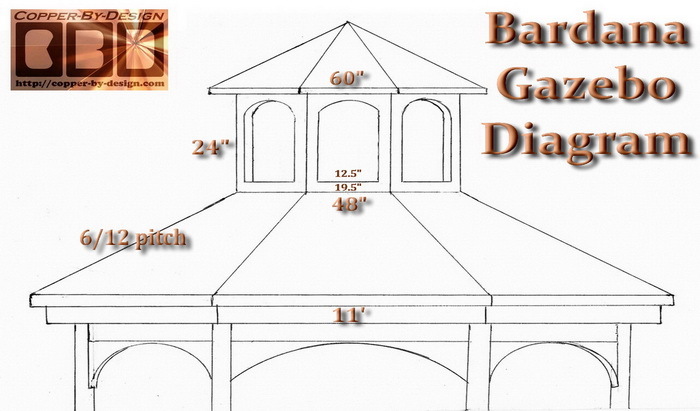 We discussed different sizes and I made them a scaled diagram to show what is would look like. 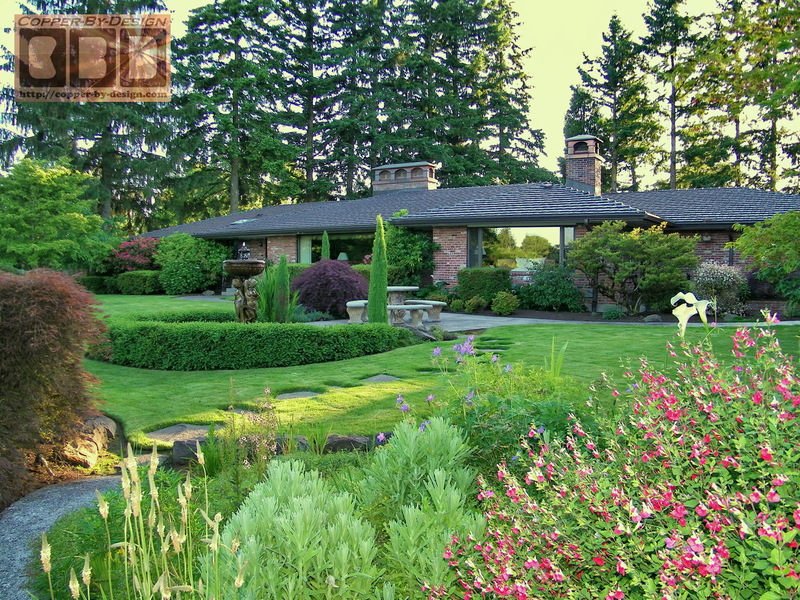 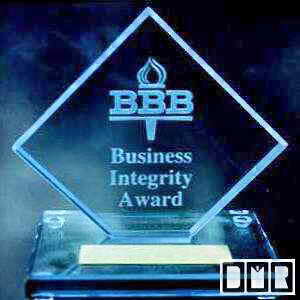 They again placed a lot of trust in me to meet or exceed their expectations with this project. This was the coolest Tuscany arch style copper project I've worked on to date. They had first contacted me 6/12/09 and then again on 6/20/10 to discuss this second major project they were now ready for, so we swiftly worked out the details of this project on site with a personal visit to their lovely garden space again. 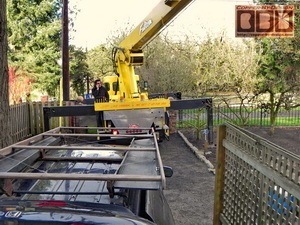 I came out to their house to check the measurements so I could provide them with a serious quote to do this. 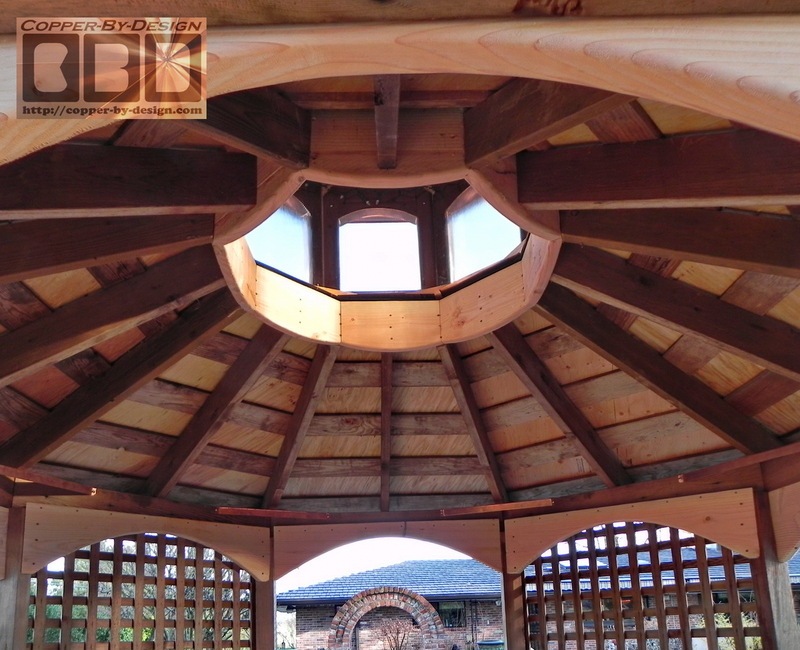 Given the width of over 11' I came up with the recommendation of a 4' wide and 2' high cupola with a 5' wide roof over that for a 6" eave out past the arches. 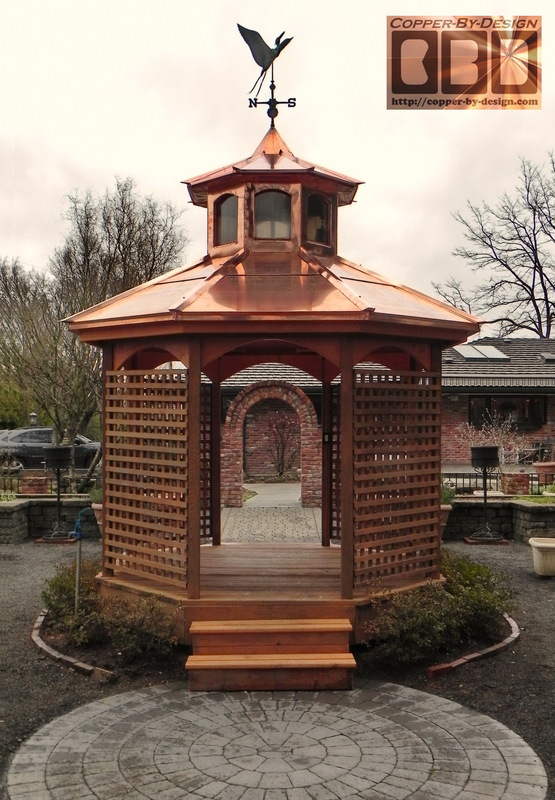 Knowing they were not looking for a cupola so big a person can sit up inside it, like the Jabusch gazebo, this was substantial enough, but should not seem too large. 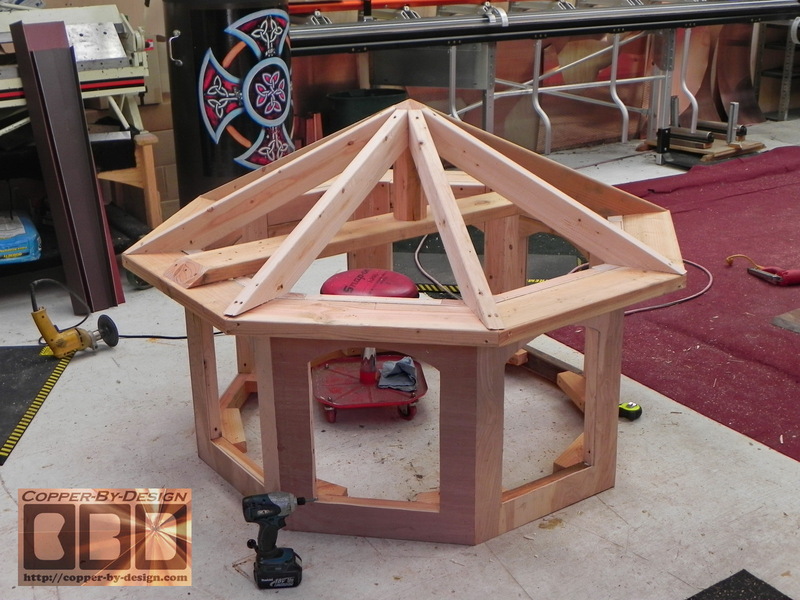 I wound up adding 3" to the width of the cupola roof and about 6" to the width of the lower roof. 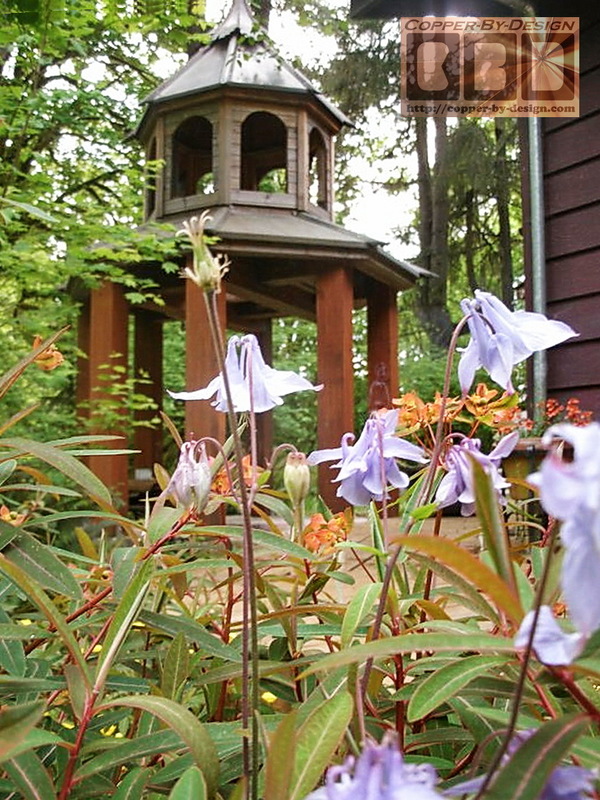 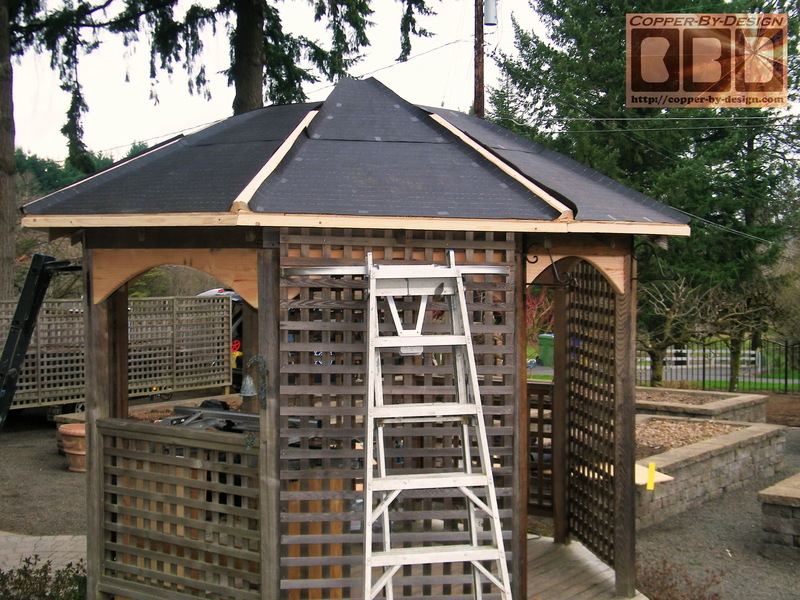 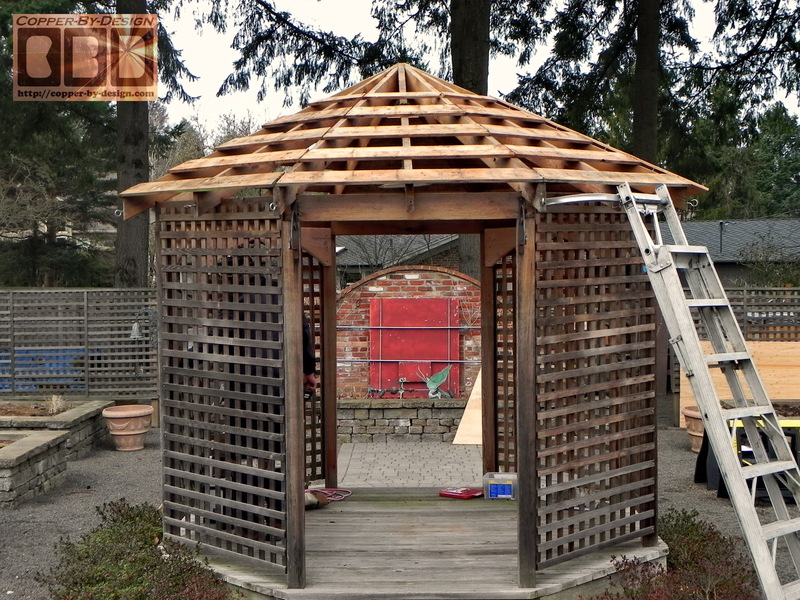 The cupola roof line is designed to match the roof line of the main gazebo roof: 6/12 pitch, so this will look more like what the architect might have designed for this gazebo, had he designed a cupola for it. 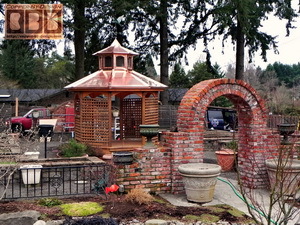 The client approved this design and were very pleased with the results. We discussed aesthetic options like adding the arched detail to the gazebo below the roof, which also adds a good deal of stability to the gazebo, so it is less wobbly up there. 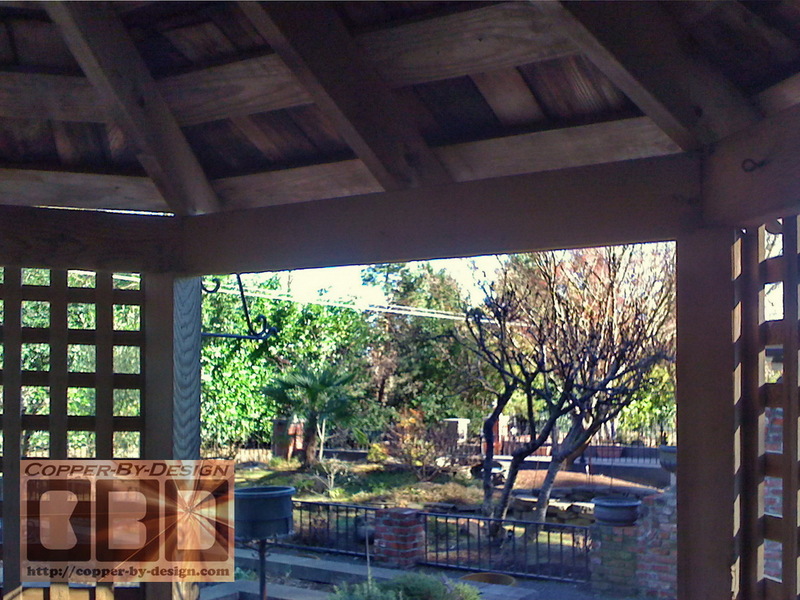 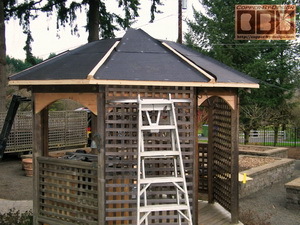 Here's the before photos showing the roofing removal. 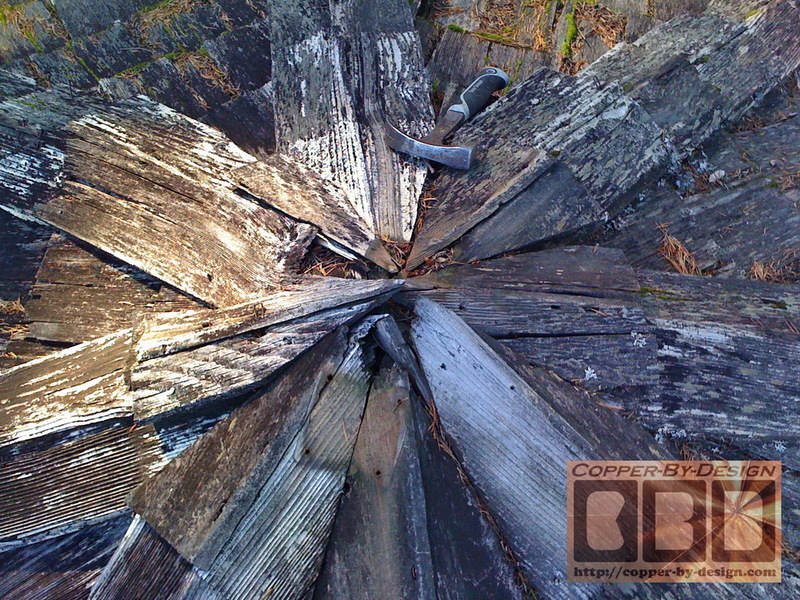 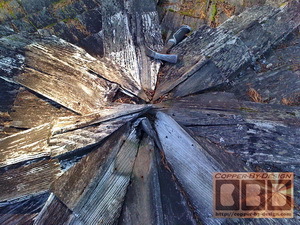 These close-up shots show how rotten these cedar shakes were and no longer sealing the roof. There were lots of water stains on the roof trusses indicating how badly that roof had been leaking. I find it very funny how most carpenters will struggle with how to join all these trusses together in the center like this, instead of just making a simple hollow core like I recommend on this web site. 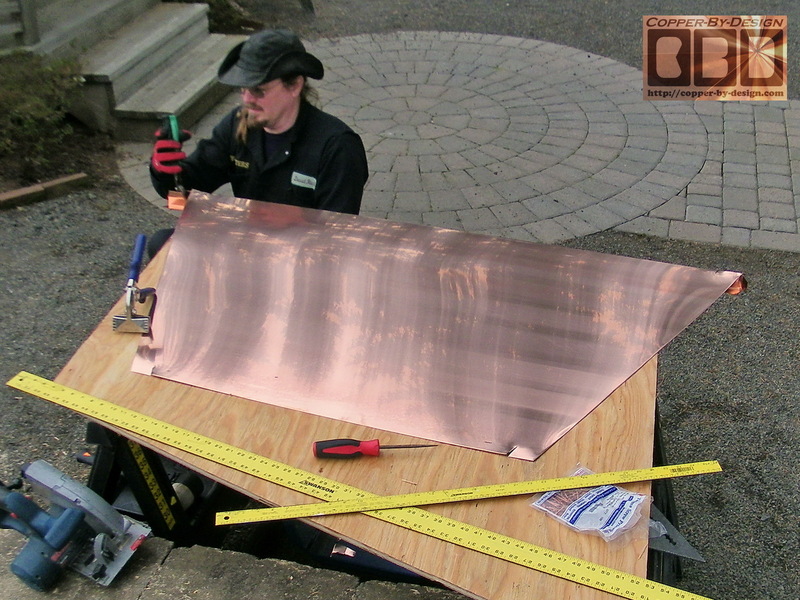 It does not have to be nearly this large. Just big enough to get a drill inside to attach those stringers with deck screws. 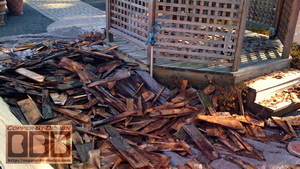 I stripped all the rotten cedar shakes off the roof leaving only this step-sheeting. Here's the plywood getting attached with 2.5" deck screws after I had cut out the center of the roof joists to install this support ring for a 36" open gap in the middle. 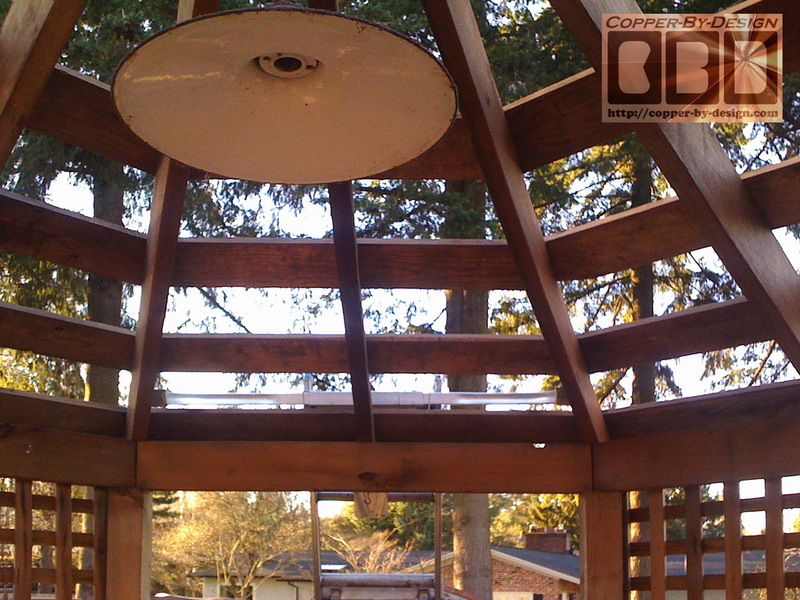 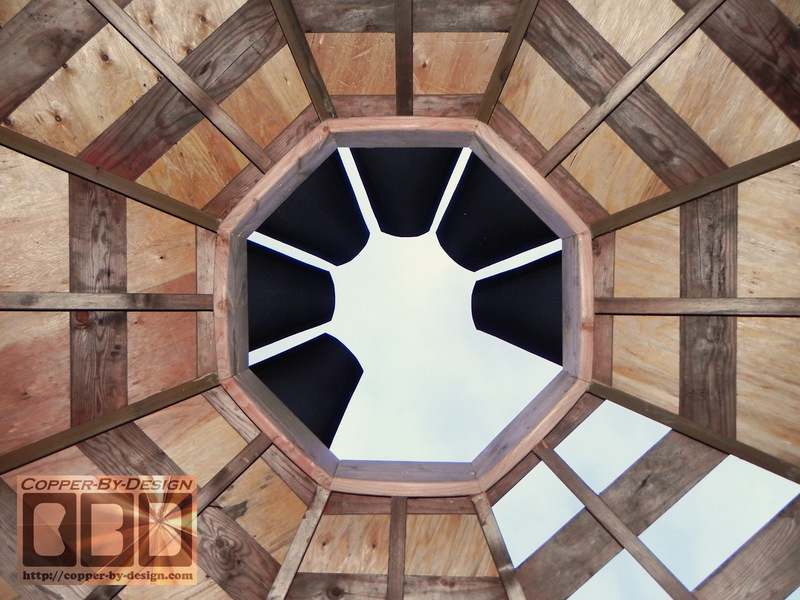 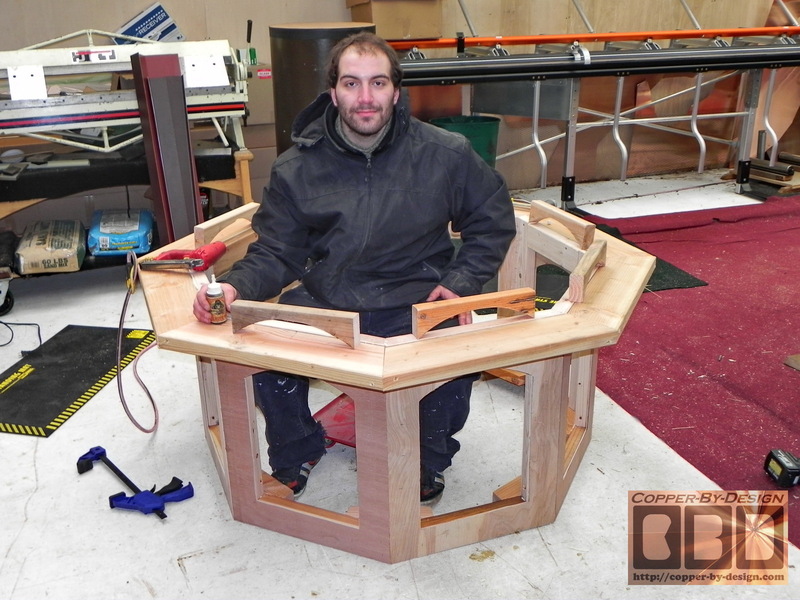 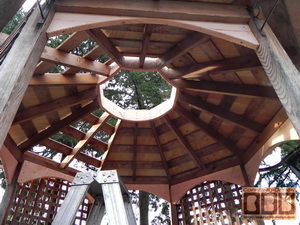 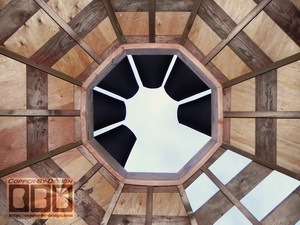 Each piece of plywood had to be carefully measured and cut to fit, since this gazebo was so irregular on each side. This does not change the roof angle at all. 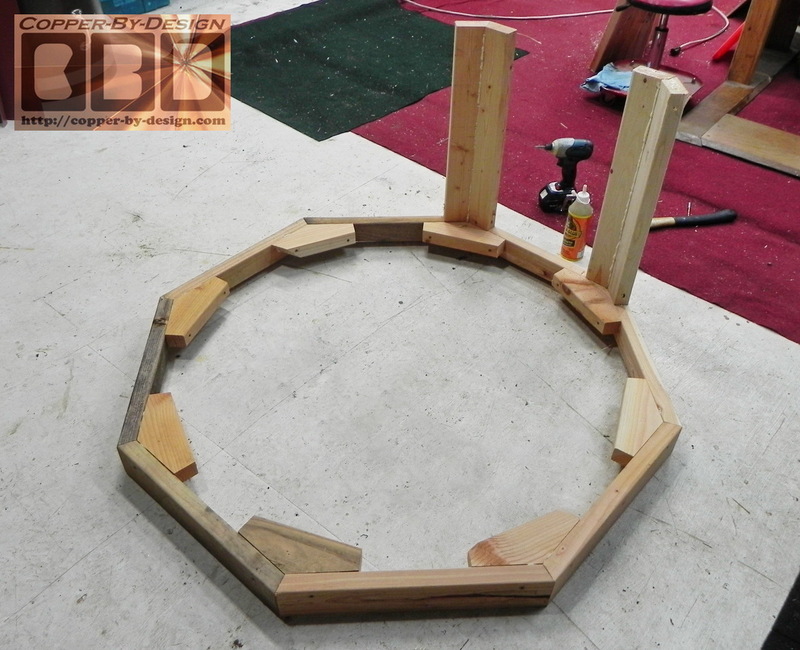 To make this support ring I was able to just use the parts I had cut out of the 2x12 boards for the lower arch supports with the grain going horizontally for the best possible strength. 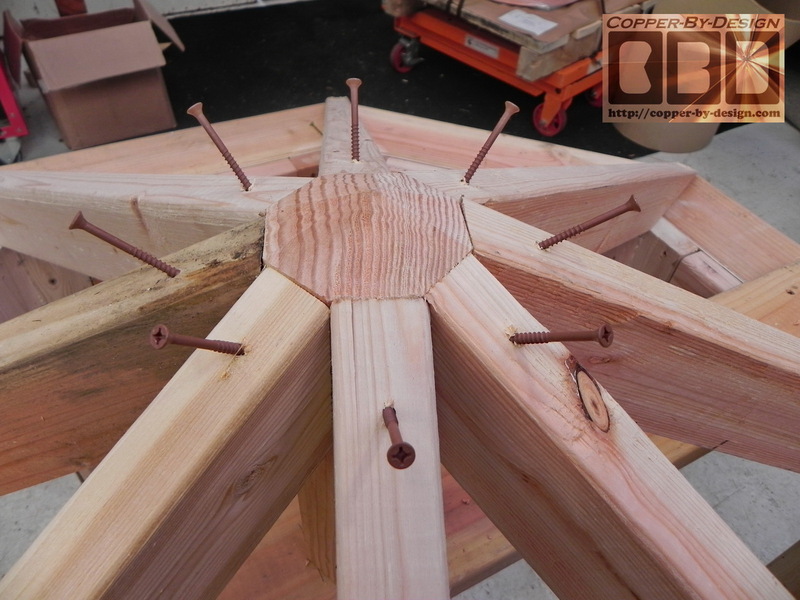 I used 48 - 3" deck screws to attach this support ring into the ends of the 16 roof joists. Then there is the hip boards that were angle cut on my table saw at a 40 degree angle for the outside and a 10 degree angle where they were glued together. Then I was able to cover most of this with 30# roof felt for the vapor barrier between the wood and copper sheet metal that will cover this to minimize the mildew than could form on the plywood from trapped condensation. 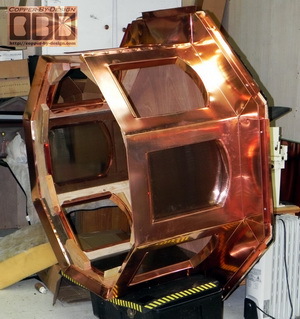 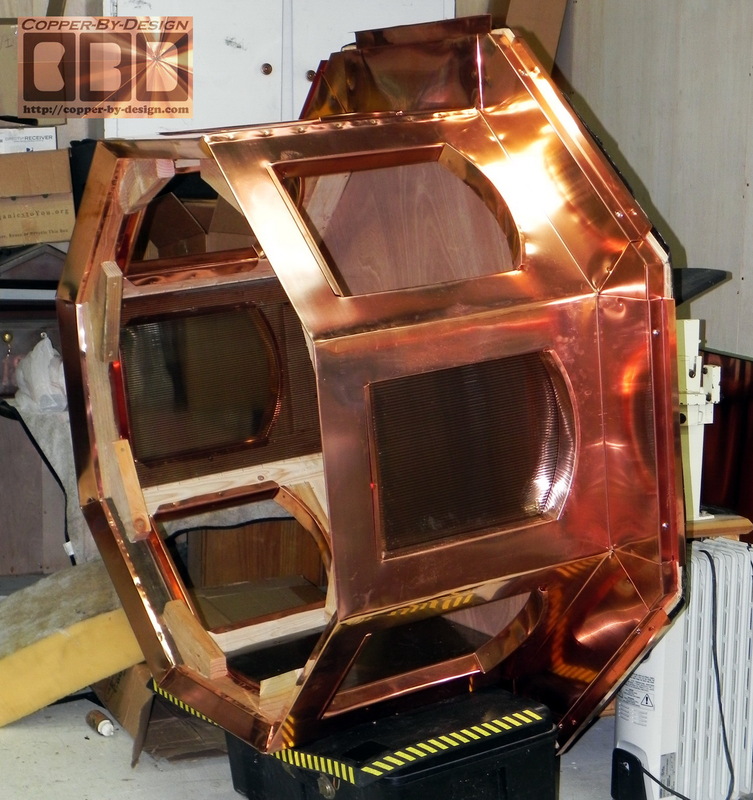 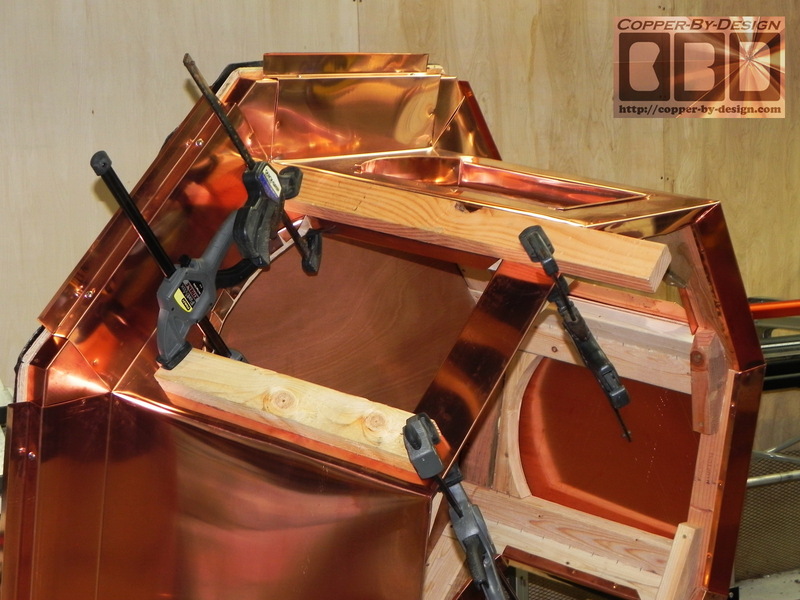 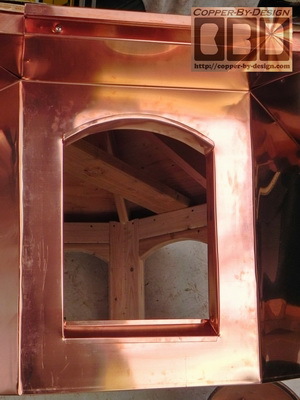 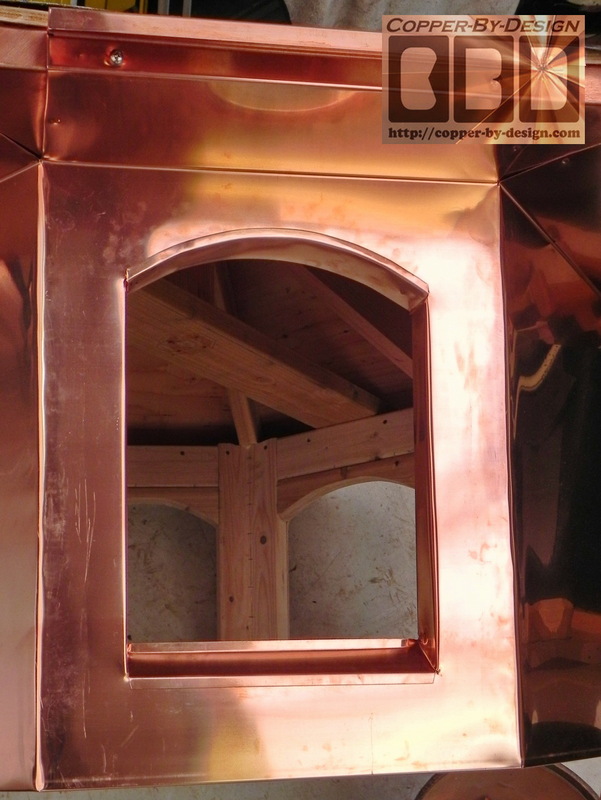 Again, each of the 24 pieces of copper had to be custom measured for each placement to fit just right one at a time. 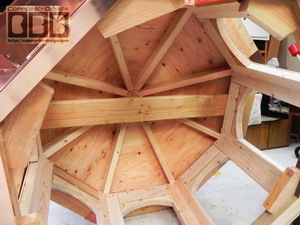 It took 4 sheets 3' x 10' to just to make the larger 8 pieces with very little left over. 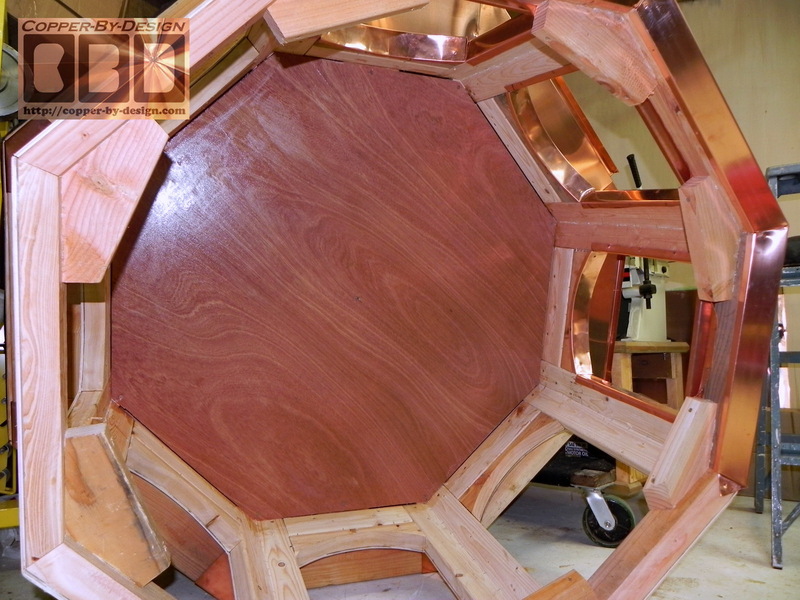 Then 2 more sheets to form the 8 upper pieces. 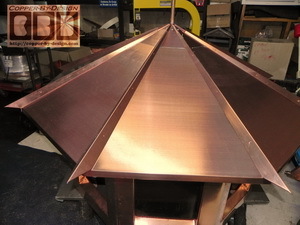 Then the cap metal for each hip. 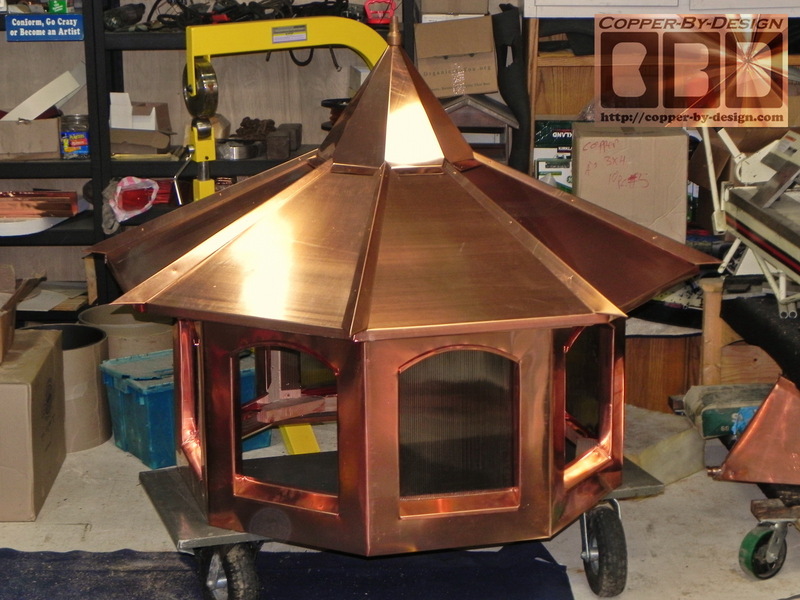 This first 16 part copper sheet set took a couple days to get ready for the cupola to be lifted on with a crane. 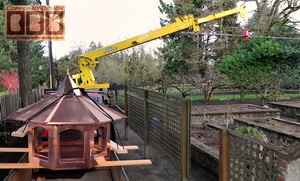 I was still working on the last piece when the crane operator showed up. 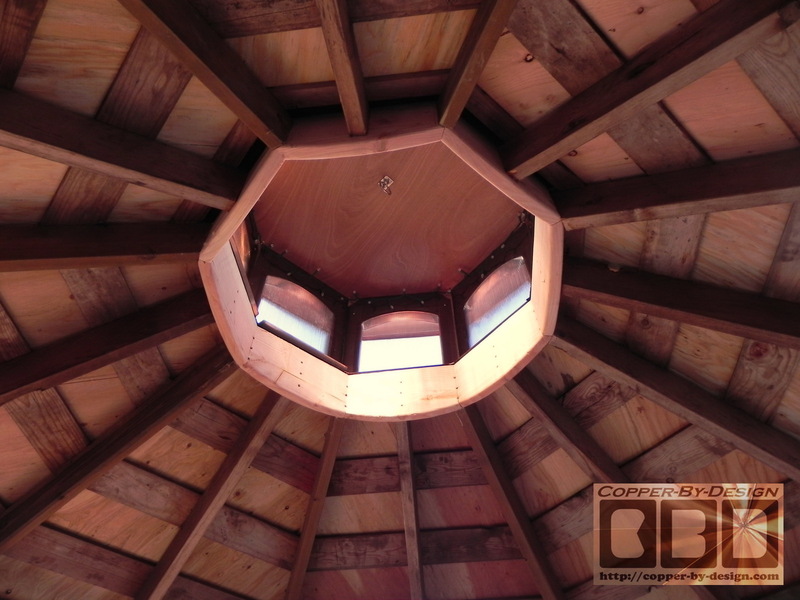 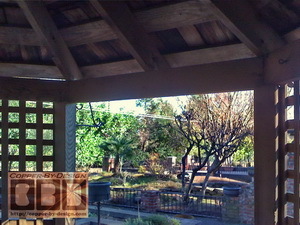 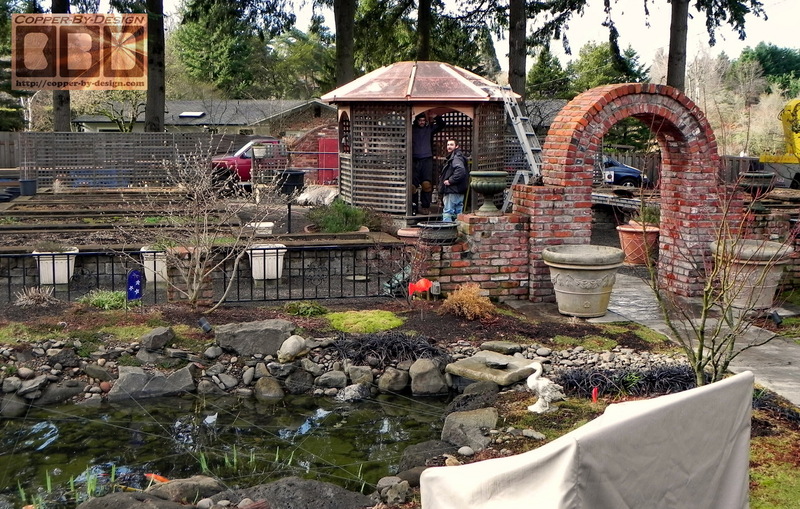 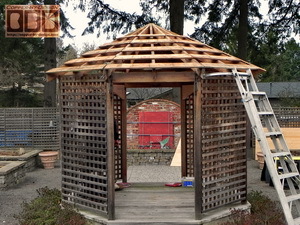 I had been working on the cupola for their gazebo throughout the previous month off and on between doing gutter jobs. 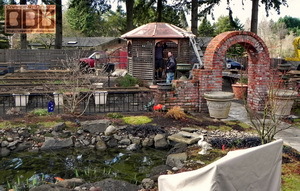 Here are some photos to see how it looked at the different stages. 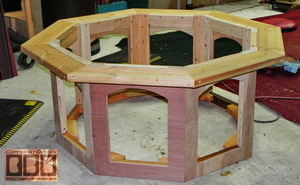 I first got the wood framework for the sides built. 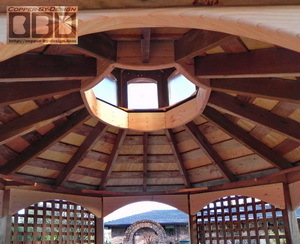 There are 56 special angle cut wood pieces in this frame below the roof. Then the eaves are made and attached from inside, which adds a lot more strength to this. I had Chris make the arch pieces and put them in. 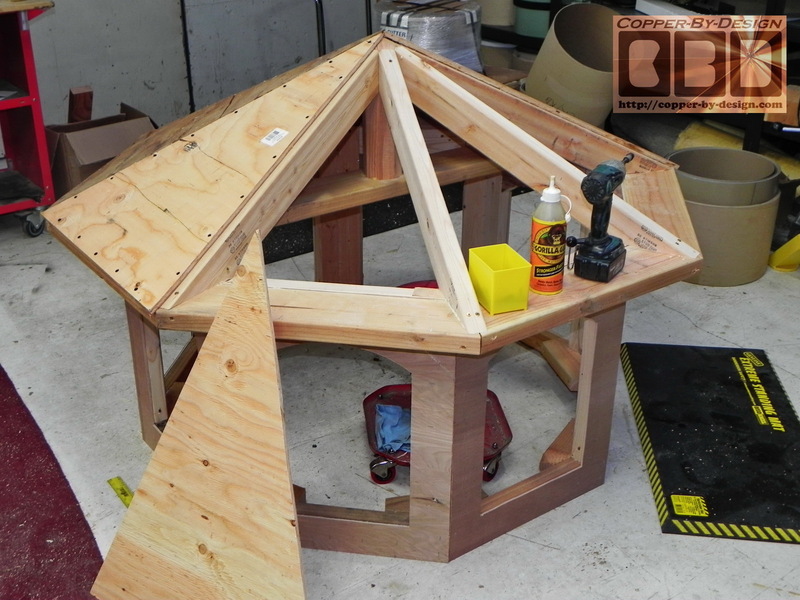 Then I got the roof joist on the cupola made. This is all assembled with screws after the expanding Gorilla Glue was applied, so it is very sturdy. With the roof that makes 74 pieces in all. Now that this wood work is done we just need to cover this in copper and make a weather vane support in the center. 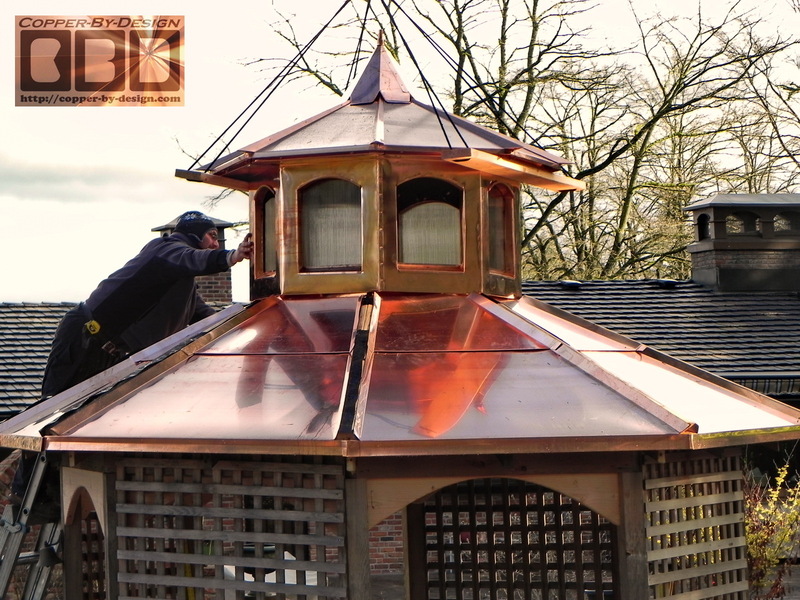 I covered this with copper. I managed to get 5 sides in one and the other 3 sides in the other piece for just 2 seams. 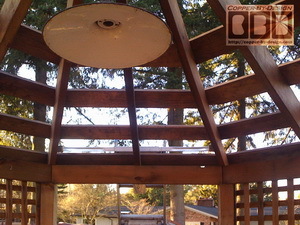 I got a wood soffit inside, so they are not looking up into the bones of this structure. We discussed what to do with the openings: louvers, stainless steel screen, tinted plastic, and stained glass windows. 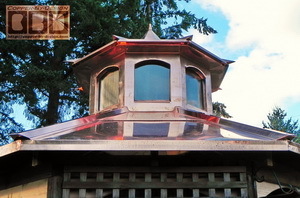 They want to have the 4 quarters changed out for painted glass windows once their relative has completed them, but for now there is the twin wall polycarbonate tinted plastic panels in. 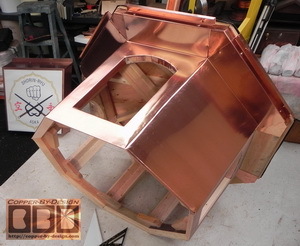 Once the side window framing was completed this was ready for the 8 copper roof skins that attach under the eaves with the hip cap metal. 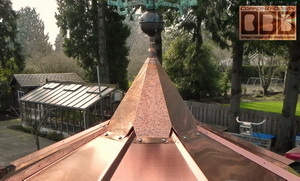 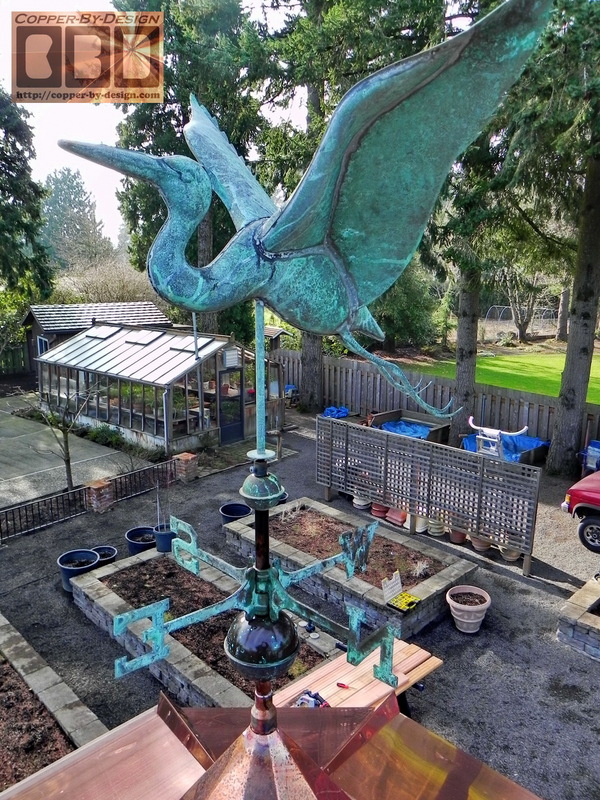 The center cone is to hold the top of the weathervane support pipe. I had a nice finial here to set in the support pipe to see what it would look like. 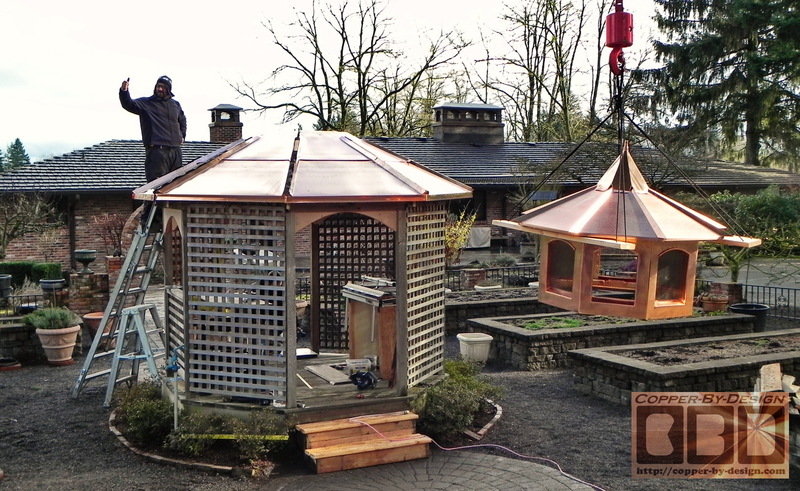 When the crane arrived I was still working on the last piece of copper sheeting over the gazebo, but got it done before he was set up. I had the cupola all set over my trailer with the lift boards and ropes ready for his hook. It only took a few minutes to get this set over the gazebo. 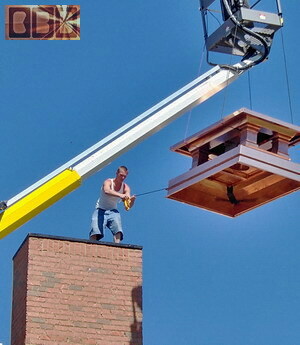 It's amazing what can be done with the right equipment. 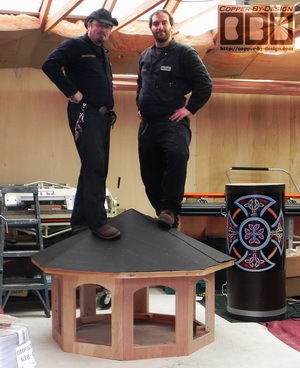 He has a $200 minimum charge, but it still is a bargain compared to what it would have taken us to wrestle this 300# cupola up there manually. It was enough of a struggle getting it out of the shop and into the trailer. The hip cap metal is not yet on. 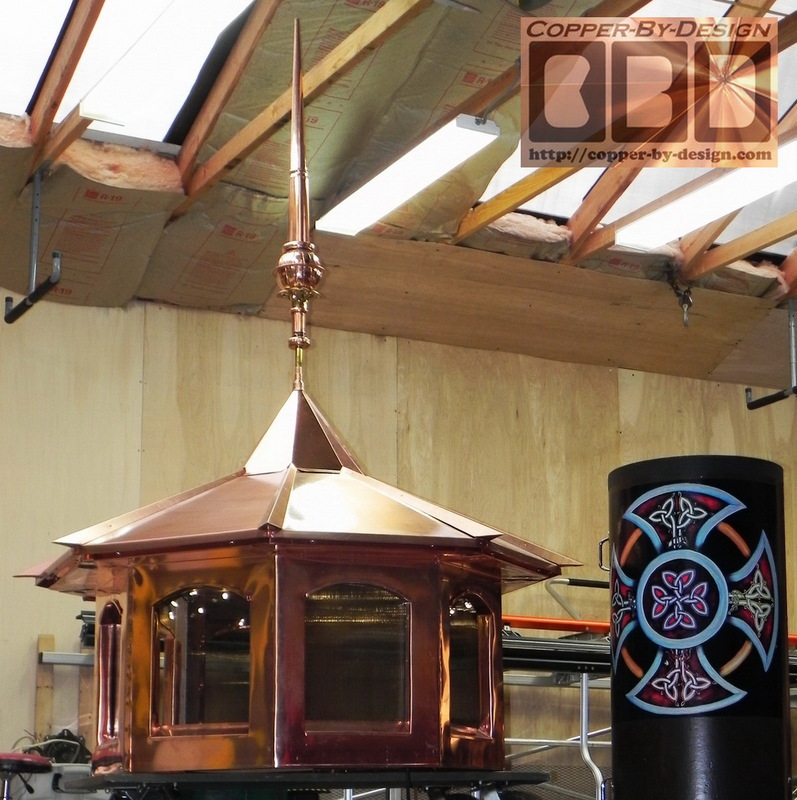 The cupola needed to be centered and bolted down with the 6" lag screws before they can be custom fitted and sealed to the corners of the cupola. 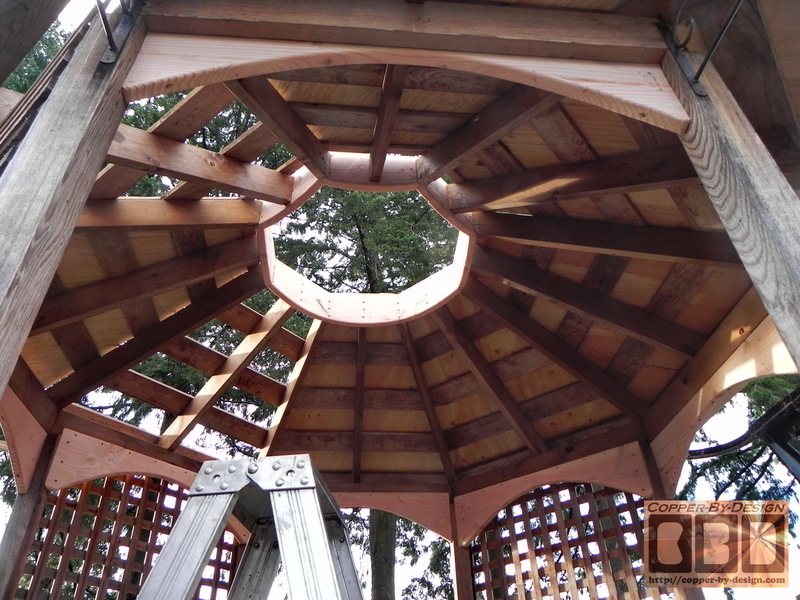 The inside of the gazebo was a bit rustic looking still, which is fine, but I gave the clients the option to have me install a nice hardwood plywood soffit up inside. I knew with all the odd angles for each side I was not going to get these in perfectly, so I decided to add this 1/2" copper piping over the seams for a very clean look. 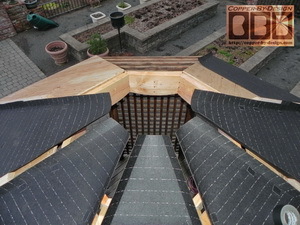 I was able to hide most of the new wiring under the floor and up in the rafters above the new soffit. 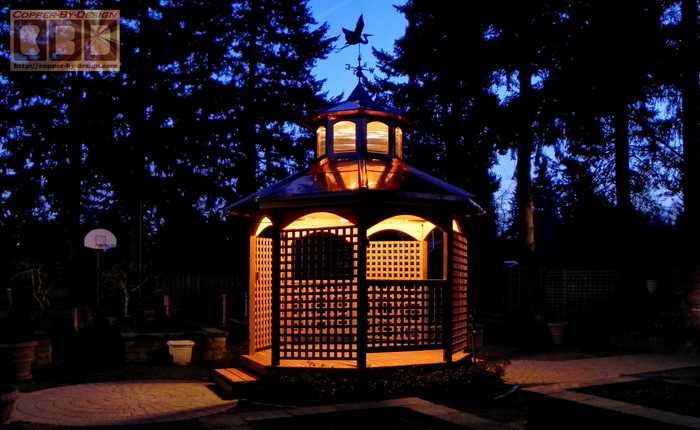 The soft LED lights in the cupola are on a timer that turns them on at dusk and off 6 hours later. It also has a wireless remote control , as well as a separate light switch down below. 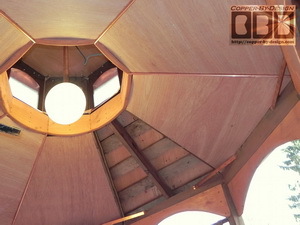 The 12" globe has a 24 watt florescent bulb that equals a 150 watt incandescent, and has it's own switch near the entry. 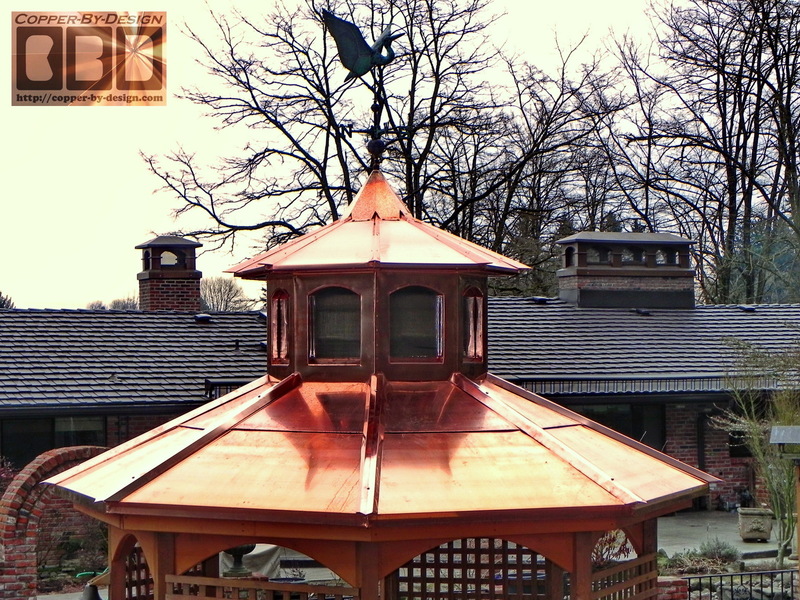 The support pipe in the top of the cupola had to be set vertically level, so their Blue Heron shaped weathervane would rotate properly in the wind before the steeple cone could be locked down. 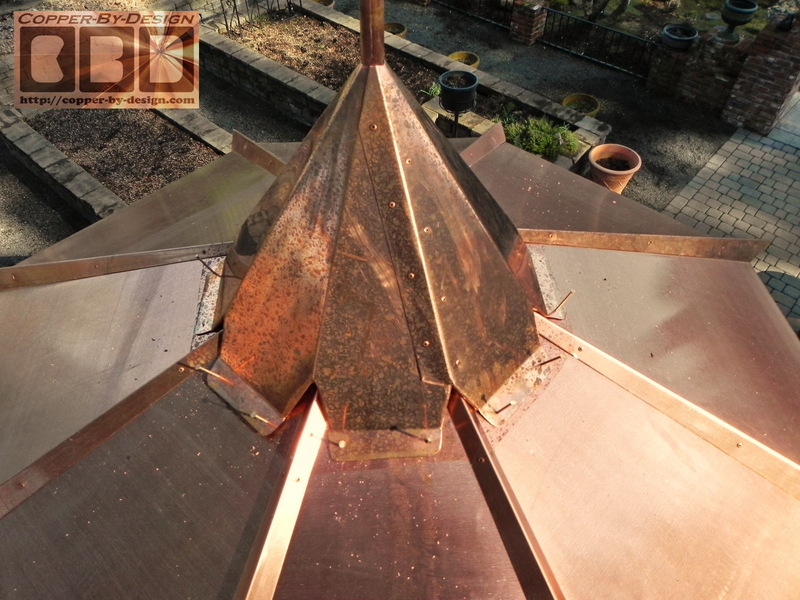 You can see the 2.5" wide vent holes in the roof of the cupola to release the heat that would build up inside in the Summer months. It is screened with stainless steel mesh. 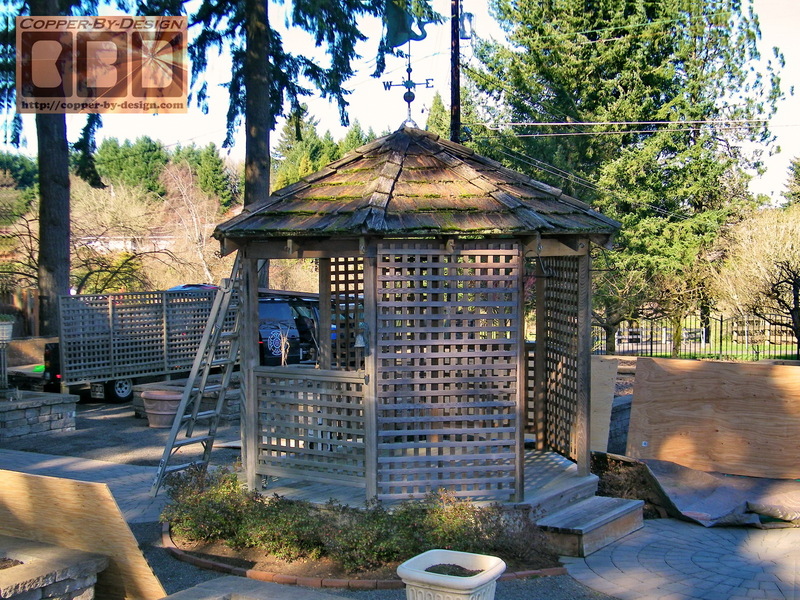 I had given them a substantial discount for this being a large project and I was rather excited to restore this unique arched version gazebo w/cupola. 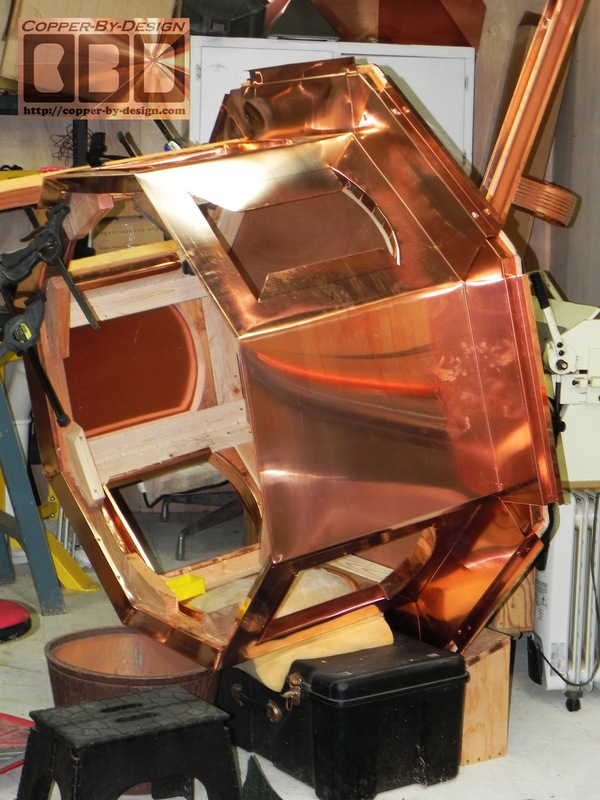 I kept track of the weights for these different parts. 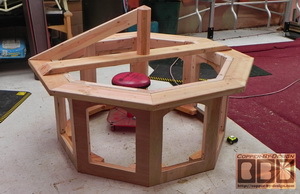 The weights and cost breakdown of these pieces are as follows. 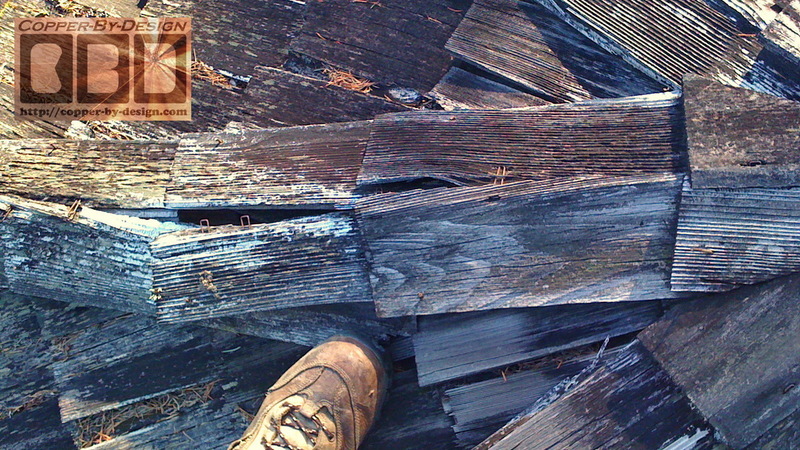 $1,320 for stripping off the old shake roof, hauling off to the dump, renailing some of the step-sheeting, installing 19/32 CDX plywood cut at custom angles to fit each irregular side attached with 2.5" deck screws, and 30# roof felt. 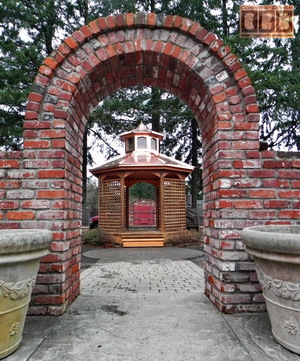 + $800 for adding 8 custom arch braces between the main support beams at $100 ea.